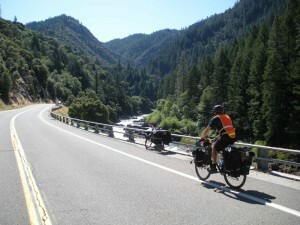 Geoff riding up the North Fork of the Yuba toward Downieville. As I climb out of the Yuba South Fork drainage, my first view of a huge dump truck approaching behind Geoff, I can hear our friend David saying “Highway 49 is too busy and the shoulder is too narrow between Nevada City and Downieville.” I briefly start to think he might have chosen wisely in deciding not to come on this tour. We quickly find that the dump truck drivers are extraordinarily courteous, probably the most considerate drivers I have encountered on a bicycle. They wait until oncoming traffic clears and more than slightly cross the yellow lines to avoid us on our loaded mountain bikes. For effect I stop and snap a photo of the next one bearing down on Geoff and wait for him to pass before starting up the hill again. After the first 10 or 12 miles the traffic really dies down, and we feel like we are on a quiet country road. This is an encouraging start to our short, 115 mile loop that slips into the northern Sierra Nevada backcountry for most of the ride, almost equally split between pavement and dirt roads with about 20 miles of singletrack to mix it up. Our first day takes us across all three forks of the Yuba River, as well as steeply up and over the watershed divides between them. All three of these rivers have great swimming holes, especially the South Fork, which is a mecca for swimming. Its cool, deep pools are lined with granite boulders to sit on or jump off. There is no river muck, only hard, grippy rock and nice decomposed granite to walk on. From a previous visit, I know that one boulder even has a rope swing, allowing the brave to plunge into the river. Weekends are busy, but you can walk up or down stream to find a private pool. Regretfully, at only 7 miles into our first day, we pass up the rope swing, deciding to come back to it at the end of the tour. In early June, the low lying start of the ride is warm but not so hot that we need a break so early. And, the ride soon climbs into a quiet, tree-lined rural area, providing shade and cooler temperatures. Pouring over maps while we wait for Pizza at the Gallows Café. We stop at a small store for cool drinks, where a few locals ask about what we are up to. After some conversation, I exit to find Geoff talking to a woman in an old pickup truck in the dirt parking lot, and I think “what a lady’s man”. Geoff returns with some camping advice, and reports that he has declined the bag of marijuana in her lap. We are not too surprised; this is northern California after all. We hop back on the bikes and fly down another hill. Each downhill section offers broad, fast curves, and the first day’s final drop is a highlight of the ride. We have to choose: keep our eyes on the road and avoid careening off the side or take in the expansive views of pine tree-filled canyons. We settle on stopping at a few overlooks. After about 30 miles, we arrive at the North Fork of the Yuba and pull into the Indian Creek Campground. Two other camps, Carleton Flat and Fiddler Creek are also available on the north bank of the river. These camps make a great first stop with pit toilets and river access. The river is shallow at our camp but still perfect for cooling off before dinner. The next day, the ride toward Downieville along the North Yuba River Canyon is pleasantly gradual after the steep ascents and descents of the first day. We arrive in the Gold-rush era mining town, have a brief look around, and devour an early pizza lunch at the Gallows Café. 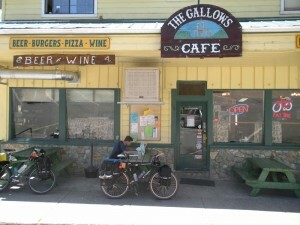 After all, any pizza is good on a bike tour, and this is our last restaurant until we get back to Nevada City. Downieville is a hard-core mountain bike town with a famous race called the Downieville Classic. I have heard that this two day race is a blast with a unique twist requiring participants to ride an identical bike on cross country and downhill courses on sequential days with weigh ins to prove that no changes have been made. For non-racers, Downieville Outfitters provide shuttle service and bike rentals for those wanting to try out dozens of miles of nearby singletrack. They also have a full service bike shop. Luckily, we have no mechanical issues. We are still full after a walk around town, and we head south on Nevada St. past the Gallows onto County Rd S401 and begin our climb into the high country forest. The road turns to dirt where we leave the houses behind, and trees offer critical shade as the day warms – critical because this is the steepest dirt road I have ever ridden on a fully loaded touring rig. The road south out of Downieville starts with 14% grade, gaining 750 feet in the first mile and continues to gain a total of 2,750 feet in about 4 miles. The steepness of the first mile requires an all-out 50 yard sprint to each slope break where we can rest up for the next sprint, gasping for breath. After maybe 10 of these sprints, we are hysterical, cracking ridiculous, sometimes obscene jokes and nearly rolling around laughing at the absurd grade and our folly for choosing this particular route. At some point during a hilarity break, an SUV passes us. A mom is shuttling her teenager and friends so they can ride down somewhere nearby. They seem duly impressed that we are riding up this crazy hill. Trudging through snow high on Henness Pass Road. At the top, we pass the SUV again as they are getting ready for their ride down. The road is wet, and both sides still have two-foot snow banks. We get back on pavement for a short while, eventually turning back to dirt on Henness Pass Rd, which follows a ridge above the Middle Fork of the Yuba and its tributaries. We start looking for camping after another few miles. Water is scarce at this elevation, but snow is available for melting, and we double our post ride Tullamore Dew ration before cooking up a pasta dinner. For more sane riders, or better planners at least, there are two more gradual options to avoid this sufferingly steep hill. The first is to turn east in Camptonville well before Downieville, getting on the Henness Pass Road sooner where it heads up a gentler ridge. This route gains the same elevation in about 22 miles rather than the 5 it has taken us. The other option is to continue on CA-49 about 45 miles past Downieville, through Sierra City and to take Yuba Pass Road to Henness Pass Road. This route adds about 25 miles and has much more reasonable elevation gain, but you miss most of the views from Henness Pass Road. Depending on the time of year, you might also miss the snow. Around 6600 ft elevation, we start running into un-rideable, completely snow covered roads where we break through up to our knees pushing our bikes. This unexpected challenge suggests we should have waited a little longer after the relatively average snow season. We debate searching for another route, but the truth is we are pretty committed (or is it ready to be committed?) at this point, and we press on. None of the snow cover lasts more than a few hundred continuous yards and we eventually find ourselves on more south-facing, melted slopes. The views of the Lakes Basin area from Henness Pass are expansive, including forested canyon and far off peaks. We have amazing views of the pinnacles of Sierra Buttes, surely a bike tour target for the future. In fact, I am already starting to think of a loop that will take in more of Henness Pass Road and include a hike on Sierra Buttes. 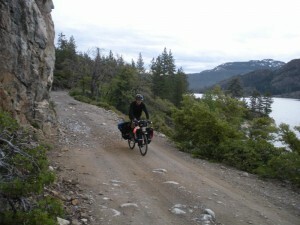 We continue on fast, hard-packed dirt until we turn off to cross the Jackson Meadows Reservoir dam. We ride around the south side of the deep blue lake and take a nap before continuing on Meadow Road to Bowman Lake where we stop for camp. The camp site is empty and perfect, sitting on granite right on the lakeshore, and we jump into the cool water before even considering setting up. We like the campsite so much that we agree in the morning to take a rest day and to investigate the waterfall that we can hear but not see. It turns out the canyon between Sawmill Lake and Bowman Lake has a huge, cascading waterfall that is apparently unnamed and does not have a trail to it. What a cool find! This ranks as one of the best bike tour campsites I have had, even considering some scattered broken glass, and we enjoy the rest of the afternoon lounging around the camp. Resting up gives us time to catch up on some reading and talk about Geoff’s still relatively new relationship, future trips, our fairly different jobs as geologists, one for a research institution and the other a private company. Looking down the Middle Fork of the Yuba Canyon on Henness Pass Road, past the snow. The ride continues along the north shore of Bowman Lake, drops down below the dam, then begins climbing up out of the basin, offering views of Canyon Creek, more lakes, and eventually the South Fork of the Yuba River. We had originally planned to bike up Grouse Ridge Road for another night’s camp and to hike up to Glacier Lake, but our experience with the high country snow sways us away from this, and we decide to complete the loop rather than brave the high country again. The descent down into the South Yuba just below Spalding Lake is a screamer, again requiring concentration to avoid losing it while looking for too long at the gorgeous scenery. We get back to Highway 20, where we begin looking for the Pioneer Trail, a 20-mile long singletrack section to complete our ride. We have never ridden true singletrack on fully loaded bikes before, and we have never ridden the Pioneer Trail, so we do not really know what to expect. After some initial difficulty finding the start of the trail we start zooming along, feeling like we are driving Cadillacs in a Gran Prix race, struggling slightly in tight turns but hauling in the straightaways. Fortunately the trail is not too technical with only a few rooty drops sprinkled through the ride. At some point we choose poorly and end up on a chattery motorcycle trail, but we quickly get back on the Pioneer at the next intersection. About two miles before Skillman Campground we pass another mountain biker at fairly high speed, and he says “Shopping cart ahead.” I imagine a shopping cart partially obstructing the trail and slow down a little to avoid a collision. It turns out that a man, apparently homeless, is pushing a shopping cart up the narrow trail. We negotiate our way around him with a brief greeting and later pass by a section that smells like someone is living there. At our next stop we wonder aloud how difficult it must be to live so far from food or shelter, how he chose this area, and what he was doing with a shopping cart that is too wide for the trail he seemed to be staying on. Riding along the shore of Bowman Lake. We continue, briefly stopping in the campground, consider staying there a night, and decide that hot food and beer sound better. 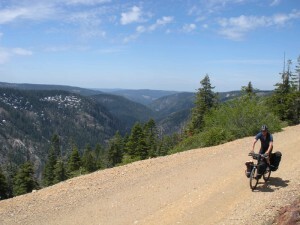 So, we keep riding down the singletrack toward Nevada City. The trail gets less technical as we approach Nevada City, and we continue ripping around hard-packed corners, gaining confidence in our loaded rigs that have no suspension. This 20 miles has been a blast, and I am sorry to see the trail end at the Harmony Ridge Market. But, I am pretty happy about the ice cream that tides me over while we finish up the last 5 paved miles into town. We are tired, but the last few, mostly downhill miles melt away, and we are back at the car deciding where to have dinner. We walk around the Victorian town to stretch our legs. Nevada City has a great many food options for a town its size, and we decide to try Ike’s Quarter for their outdoor seating and enjoy Voodoo Burgers with caramelized onions, Andouille sausage, and creole remoulade. Of course, the dinner conversation revolves around where we will ride next. 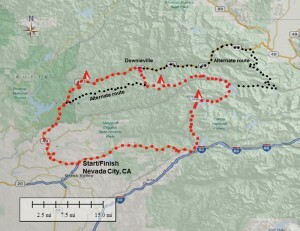 Start finish – Nevada City, CA has hotels, restaurants, and markets to resupply. Time of year – Summer or Fall. 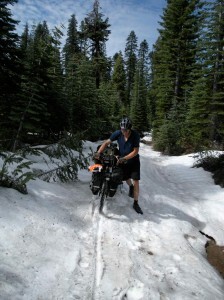 We rode in June and encountered some snow. Ride – 115 miles with >10,000 feet of climbing. Many paved, dirt road, and single track options for longer loops. Food and Supplies – Nevada City has the most to offer in terms of restaurants and markets. Camptonville and Downieville have small markets to resupply, and Downieville has a few restaurant options. Water is plentiful along the ride from rivers and lakes, but the Henness Pass Road may be dry due to its high elevation. Bikes – We rode rigid mountain bikes. Front suspension is recommended but not required.